Spider veins are small, bluish veins seen on various areas of the legs and occasionally the face. They can resemble a bruise in appearance however, small spider veins make up the network. They are typically painless and without associate symptoms , although some may cause local itching of the skin overlying the area or surrounding. Spider veins may be linked to a medical condition known as chronic venous insufficiency. Venous insufficiency is a very common condition affecting more than 50 million Americans. The main cause is leaky valves in the leg veins which can be detected by a quick ultrasound. Spider veins can be treated by injecting a medication (known as sclerosant) directly into the spider veins with a small, pinpoint-sized needle; similar to a Botox needle. Local numbing cream may be applied to the overlying skin prior to treatment. The solution works by flushing out the blood within the small veins and damaging the cells lining the vein wall. Veins are seen to spasm and ‘blanch’ or disappear during the procedure. The procedure typically takes 15-20 minutes with no downtime and immediate return to normal daily activities. Our physician, Dr Altuwaijri will then decide if a compression stockings would need to be worn. The advice of wearing compression stockings is a case to case decision depending on the underlying cause and the presence of symptoms. The medication used at OC VeinCare is an FDA-approved solution which provides a safe and effective, permanent solution for spider vein treatment. Dr. Altuwaijri may choose to use foam sclerotherapy or straight solution sclerotherapy depending on each patient’s individual needs. The feeder veins leading to the spider vein cluster is very easily identified using adjunctive measures such as magnification lenses and a special light and if present, will be targeted during spider vein treatment. This ensures the source of the spider veins are treated, resulting in the best optimal results. Sclerotherapy is well tolerated by most patients without the need for anesthetic cream – We do however, offer a numbing cream option upon request. Your spider veins can be treated at our OC VeinCare’s Laguna Hills office. All treatment sessions are performed by Dr. Altuwaijri who is a board certified Vascular Surgeon. Dr. Maraya Altuwaijri will diagnose your spider veins after a detailed history and physical examination. If symptoms are present, a duplex ultrasound, which identifies how your blood is moving through your veins and any leaky valves will be recommended prior to the cosmetic treatment of spider veins. Symptoms include but are not limited to leg pain, throbbing, tired, fatigued legs, cramps, restless legs, hyperpigmentation (or ankle and leg discoloration) and ankle swelling. Dr. Altuwaijri will determine if the appearance of spider veins is cosmetic in nature, or if they have an underlying medical cause, based on the results of the ultrasound. Spider vein treatment and after care will be outlined by Dr. Altuwaijri following your initial visit. What is the VeinGogh Procedure? The VeinGogh Procedure, AKA: Ohmic Thermolysis) is a procedure used to eliminate small size spider veins. Using an insulated probe, a fine needle is introduced into the vein to thermocoagulate (change temperature to) these blood vessels. A micro-burst of energy heats the vein, coagulating the blood and collapsing the vein wall. While not replacing sclerotherapy, which is the mainstay of treatment of lower extremity spider veins, the VeinGogh procedure is useful as a supplement to sclerotherapy. It can be used as the primary treatment of very tiny-sized spider veins of the lower extremity. 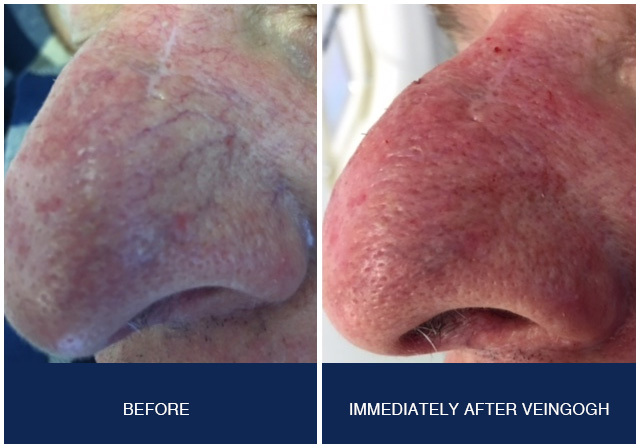 It is also an excellent procedure to manage spider veins that appear on the face and around the area of the nose. Is the VeinGogh procedure painful? There is minimal discomfort during the veinGogh procedure, which often described by patients as a slight “pinch”. For patients with a lower pain threshold, a local anesthetic cream can be applied prior to the procedure. Treatment time is dependent on the areas being treated and varies from just a few minutes to 15 minutes. There is no post-procedure down time, and patients immediately return to their daily activities, even aerobic activities. When treating spider veins of the lower extremities, there is no need for post procedure compression stockings to be worn.